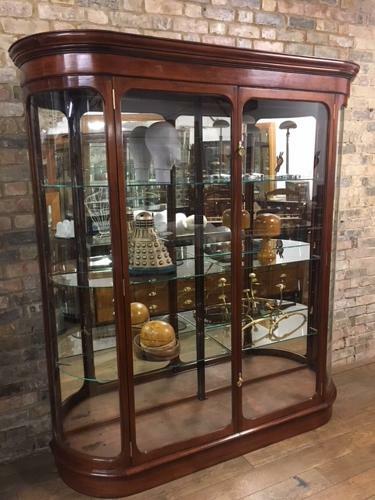 We create fabulous large display cabinets at Binder's for shops worldwide - this particular cabinet is one of our best, made of reclaimed mahogany with two bow glass ends. This shop cabinet has three glass shelves, so has plenty of space to store clothes, smalls, specimens, hats, books, and more. It has a lovely carved top and antique style handles. It would be absolutely gorgeous in any shop, home, museum, or department shop. We can make this cabinet to any size and shape.